One of the earliest broad applications for metal detection technology helped military personnel of the early 20th century avoid, detect and defuse land mines. In food manufacturing, metal detectors have for many years helped companies avoid the business equivalent of a land mine: the dreaded recall. "Metal detectors continue to be commercially viable because the technology provides an affordable contamination detection tool, regardless of company size," says Bob Ries, lead product manager for metal detection at Thermo Fisher Scientific Food (www.thermoscientific.com/productinspection), Minneapolis. "Beverage, bakery, meat, snack foods, confectionary and dairy all extensively utilize metal detectors at many parts of their processes." 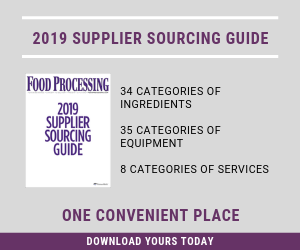 Keeping solid, foreign material out of foods has always been crucial for processors, but as companies are currently bracing for further regulation under the Food Safety Modernization Act, it might be more front-of-mind than usual. Experts say a comprehensive approach to metal detection provides an opportunity to drive incident rates to the lowest possible levels. The types of metal detectors most commonly used in food processing include in-line devices for free-flowing materials. These are typically installed in piping and gravity fed. Rectangular aperture devices, the other main type, wrap around conveyers for inspection of individual units. The latter often is used in conjunction with a checkweigher and typically has the ability to reject individual units when contamination is found. "Metal detection dovetails extremely well with checkweighers as an increasing number of food processors attempt to optimize their limited manufacturing space," says Ries. "Many are faced with the challenge of looking for metal contaminants and weighing the same product in limited production line space. Metal detection is also a good companion to X-ray inspection because of its superior ability to detect items such as foil, wires or lightweight aluminum that could be missed by other inspection technologies." Depending on the application, any metal detector at times may be used in concert with sensor-based or camera-based visual inspection equipment or X-ray, says Rob Rogers, senior advisor for food safety at Mettler Toledo Safeline (http://us.mt.com), Columbus, Ohio. "In applications where metal detectors may struggle, X-ray technology usually has increased benefits; and where X-ray inspections are difficult, often times metal detection systems are utilized," Rogers says. "It is important that the technology utilized should be part of a complete and robust foreign material prevention program." While the basic types of metal detection equipment are well established, newer features become available on an ongoing basis. "Improvements in data management and operational efficiencies are some of the latest areas of focus," Rogers says. "With increasing regulation, record keeping and verification of monitoring activity have an increasing importance. With options such as Automatic Performance Verification, Access Log information and USB data ports, most technologies complement each other." Software has evolved too, especially in the last couple of years, Ries says. "New techniques have been added for cancelling product effects, displaying and saving information about contaminant types and translating help text to more than 10 languages, making the metal detector truly functional worldwide." Metal detectors of the 1950s operated on vacuum tubes; by the 1960s transistors were introduced; and 20 years later most ran on integrated circuitry. Both analog and digital metal detectors of the 1990s used digital signal processing, Ries says. Today's equipment offers advances in things like durability and washdown capabilities, as well advanced functionality. "Metal detectors in the 2000s take advantage of these technologies along with computer simulations for magnetic fields/coils and advanced signal processing algorithms to remove noise and cancel product signals," he says. "The result is metal detectors that are more sensitive, easier to use and less susceptible to factory effects than ever before." Metal detection systems that have entered the marketplace in recent years allow food processors to push performance limits by being able to detect and reject smaller metal contaminants. The result is that a higher quality product enters the distribution channel. "This capability enables processors to revise their HACCP [hazards analysis and critical control points] plan, which coincides with the improved performance demands being driven by new food safety standards," Reis notes. "Also, most metal detectors are capable of storing use and audit data to a network location so records are easily available should there be an audit necessitated by an inspection." Costs have also come down, and equipment is easier to obtain when needed. "In most countries around the world, food processing facilities will now be able to take delivery of a new Apex metal detector in less than 48 hours, versus the industry standard of four to six weeks," Ries adds. The push for more stringent prevention has come both from large suppliers and from governmental pressures, Rogers says. "Most retail standards already require that some type of foreign material inspection device be used. Regulation and food safety laws mandate that hazards identified through HACCP be controlled, and in today's modern production facilities, metal and other foreign material is often considered a potential hazard," Rogers says. The end result is an added peace of mind, but it can also mean more business, as was the case for a large spice packager in the southeast U.S. that worked with Thermo Fisher on a major upgrade. "Due to the standards at a large grocery store chain, the spice packager recently purchased and installed X-ray machines on all of its production lines — a $1 million capital investment," Ries says. "X-ray was selected due to metalized film seals on the bottle caps, its excellent sensitivity and its ability to find non-metallic foreign objects. These systems have helped the spice packager improve quality and attract additional retailers." Mettler Toledo Safeline offers a free one-hour webinar covering the basic principles of metal detection through to the implementation of a comprehensive program. All registered webinar attendees will also receive a complimentary copy of Reduction of Metal Contamination – Building an Effective Program, a newly published, 63-page definitive industry guide for all those involved in understanding and implementing metal detection technology.